Although some of us would rather curl up somewhere warm and sleep through the cold Nova Scotia winter, the reality is that we will all find ourselves braving the elements more often than we might like. While the beauty and calm of a fresh snowfall can be disarming, this time of year it is especially important to use caution as a pedestrian. Be extra vigilant crossing the street in the winter, and always use crosswalks. Remember that every intersection is a crosswalk although not all of them are marked. Drivers must stop for pedestrians waiting to cross or when they’re already in a crosswalk. However, just because a pedestrian has the right of way doesn’t mean a car can or will stop. Look both ways before you cross the street. The new pedestrian penalty implemented in HRM this year is the topic of much debate, with “jaywalkers” liable for a fine of $697.50 in some circumstances. Should you be unlucky enough to wind up with a ticket under the new bylaw, that does not preclude you from making a civil claim for personal injury. In the case of pedestrian collisions, there is an obligation of the driver of the vehicle, by virtue of section 148 of the Insurance Act, to prove the pedestrian is at fault. Therefore, the driver who hits a pedestrian is deemed to be at fault until it is proven otherwise. The driver/defendant may allege contributory negligence on the part of the injured person. This means that the pedestrian was partially responsible for the collision. For example, if a pedestrian walks out into the street without looking or runs across the street, a court may determine that the pedestrian is partially at fault for the collision. The injured pedestrian’s claim will then be reduced accordingly. As an example, if the court finds the pedestrian was 50% responsible for the collision, his/her damages award will be reduced by 50%. If you are unlucky enough to be struck by a car while you are a pedestrian, it is always a good idea to arrange a free consultation with a personal injury lawyer to see whether you have a claim worth pursuing. 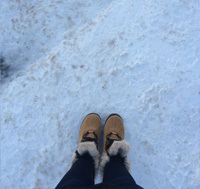 As snowbanks begin to grow, they also reduce visibility for pedestrians and drivers. Remember that your access to the other side of the street could be obstructed by a snowbank, so think twice before trying to race a walk light. Don’t attempt to walk across a crosswalk when the hand is flashing or the countdown timer has already started. If you encounter a snow plow while you are out walking or shovelling, give it a wide berth. 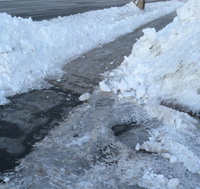 Plows can toss snow and ice a great distance, or push over snowbanks, potentially causing injury to anyone too close. Snow and ice reduce traction and it can be easy to lose your balance. Protect yourself by wearing sturdy footwear with good grips on the soles. Take your time when you are walking in winter conditions rather than rushing over slippery terrain and watch where you are going. This could mean putting your smartphone away until you arrive at your destination.